We’ve had a whole year to wait for this release since Valentine announced that they were to make a new record at last years Firefest show, so the big question is “Was it worth the wait?” Well, that’s a big resounding “Yes” folks. The band have not tried to modernise their sound and have kept true to their signature sound, hey, if ain’t broke don’t fix it! The opening track ‘Dream All The Way’ has the wonderful harmonies we have come to expect from Valentine and of course those lovely ‘Perry-isms’ (if there is such a word) from Hugo. That’s not to say that this is just another solo outing in all but name for the man, as all the band contribute to the song writing and the music is all the better for it, a special mention must got to Adam Holland’s fiery fret work that sets many of the songs alight. There is light and shade to the music and the debate still rages what melodic rock or AOR is, well folks this is as close as you get, believe me! ‘Picking Up the Pieces’ has a strong chorus and some strong keyboard work from Craig Pullman which really sets the mood for many of the songs on offer here. Far too many bands drown the keyboards out and lose the atmospheric feeling that the instrument can bring to the song, but with Valentine it is used to maximum effect. Fear not, the band aren’t going all mushy on you and the driven Escape era sounding ‘One More Chance’ is a joy to have blasting from your speakers any day and shows that the band can rock with the best of them. The build up of the majestic ‘Pages’ takes us to the heights that Enuff z Nuff reached with their Strength release and also offered a nod to the bands time as Open Skyz many moons ago, it is also one of the most experimental songs that the band have written. Exceptional song writing and some wonderful vocal harmonies entwine to take the song in all sorts of directions and show that the band have a lot to offer for the future should they decide to record again and lets hope they do. If you’re a fan of the wonderful feeling that bands like Survivor or NightRanger gave you, then ‘Every Time You Go Away’ or ‘Wait’ will set your mood right back to the glory days of the 80’s when polished feel good rock ruled the airwaves, the guys just keep on ticking all the right boxes for me with this release. 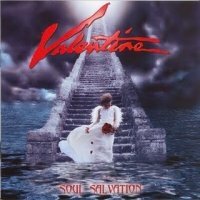 The strength of any melodic rock release is in the word melody and with the singer to project it to the listener in my opinion, ‘I’ll Be The One’ like so many songs on offer here does this and keeps the song floating around in your head for days and that to me makes Soul Salvation a success for Valentine after long absence.